The Old Town Hall was built in 1867 and is one of the nicest places to have a meal we can imagine. 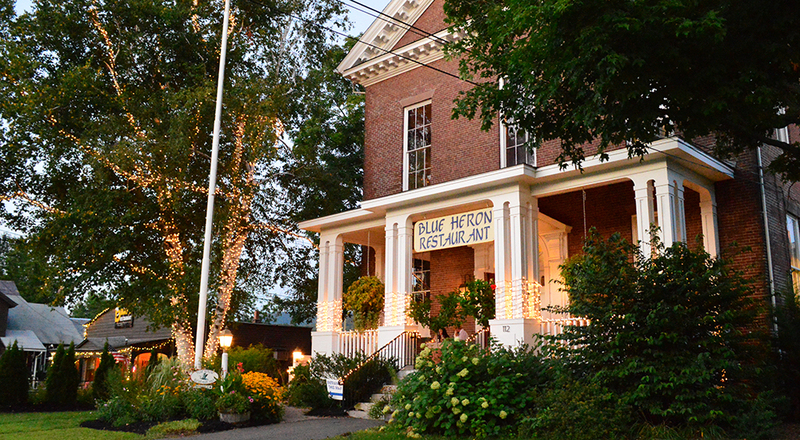 I finally dined at Blue Heron for the first time about a month ago. Molly has been raving about the place since I’ve known her. I’ve no idea now why it took this long to try it, because it’s fantastic and we’ve already been back again. Wednesday nights the oysters are half price and there are a few additional small plate options thrown into the mix. It’s all the excuse we need to go. We sat at the bar for each of our visits because both times we decided to go on a whim and there weren’t any tables. You absolutely need reservations for this place on Wednesdays. It’s probably a good idea most other nights too. The bar is great though, and the bartender, Paul, makes a mean cocktail. 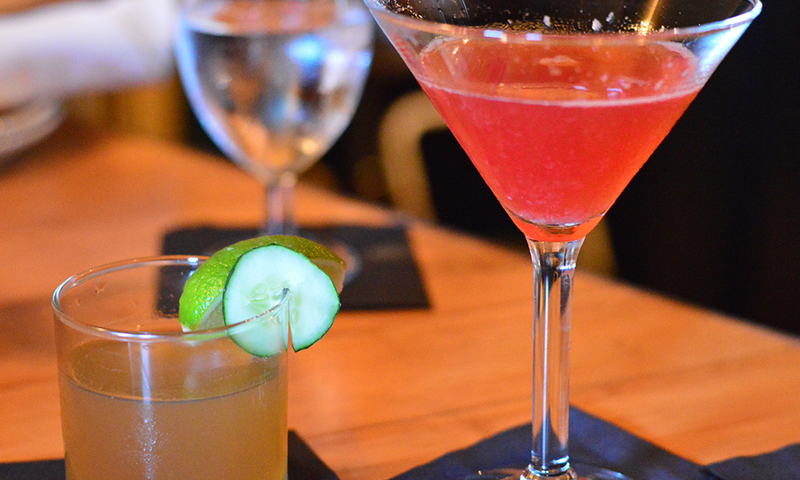 Our mutual favorite is The Summer Healer which is Basil Hayden’s Bourbon, ginger simple syrup, grapefruit bitters and muddled lime and cucumber. There are more than a dozen other options and we’ve yet to have one we didn’t like. The Summer Healer on the left and on the right The Paper Plane, another bourbon cocktail with Amaro Nonino, Aperol, and lemon juice. First, who doesn’t like sardines? I don’t. That’s who. So my endorsement of this little salad is that much stronger. 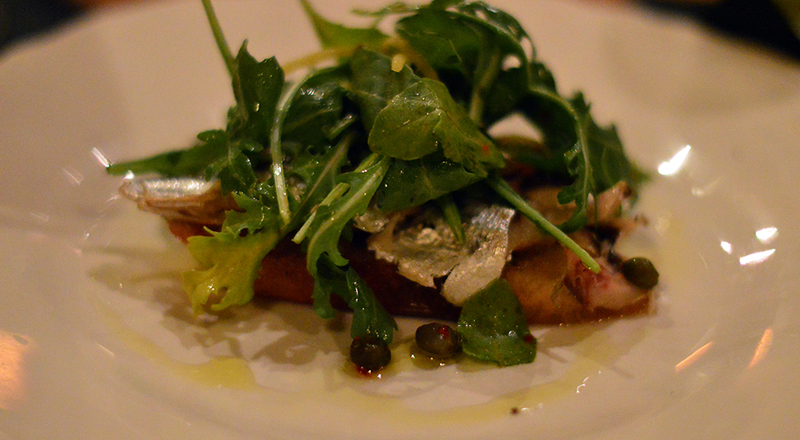 Molly loves sardines and forced me to try these with capers and herbs on a sliver of tomato bread. Delicious! Something that pleases both the bold sardine lover and the timid alike. Next we have another sometimes hard-sell ingredient: dates. How do you get the timid interested in those? 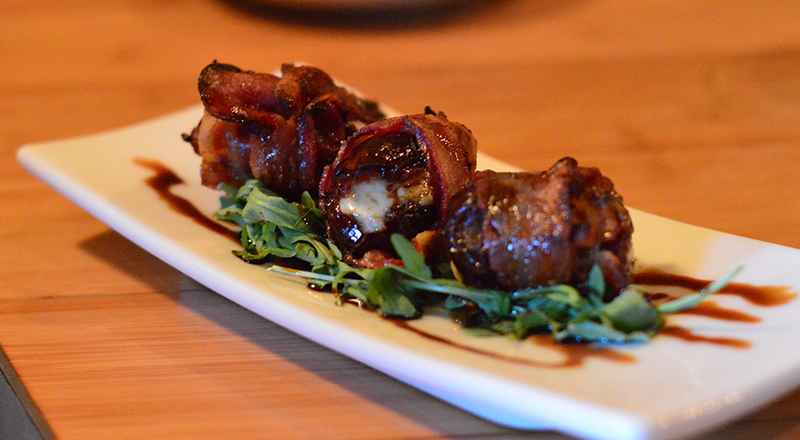 Stuff them with absurdly good blue cheese and wrap them in bacon of course. It’s a frequent pre-meal treat in a lot of places, but The Blue Heron makes it their own with arugula and instead of the standard reduced balsamic they go with saba, which to me has a little less pinch and a little more sweet. 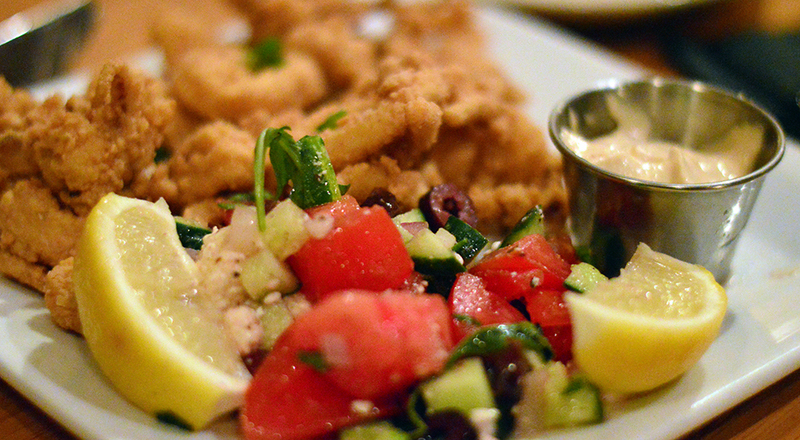 Calamari is also one of those things you see on every menu, but here again we see a clever twist: chickpea batter, a yogurty tarator sauce, and what we’d describe as a baby Greek Salad give their tasty squid its Middle Eastern flare. You won’t want to go back to ho-hum marinara after this. 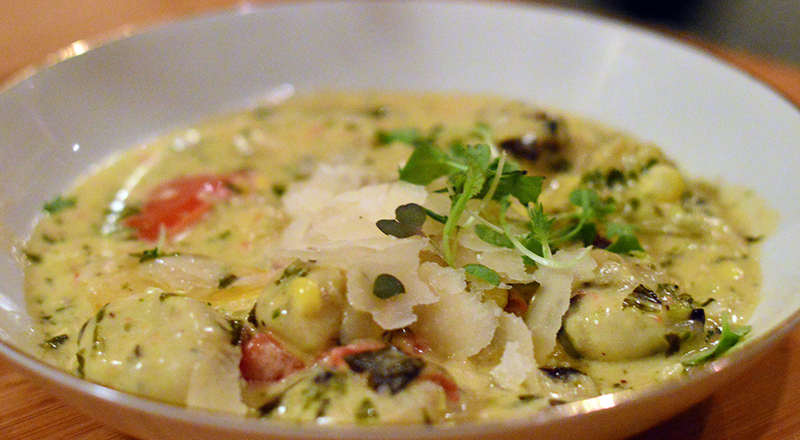 The Gnocchi is included in their small plates, but even a small portion of these little dumplings is a meal. There’s a different sauce each evening so you can indulge every time you go and still get something fresh and new. 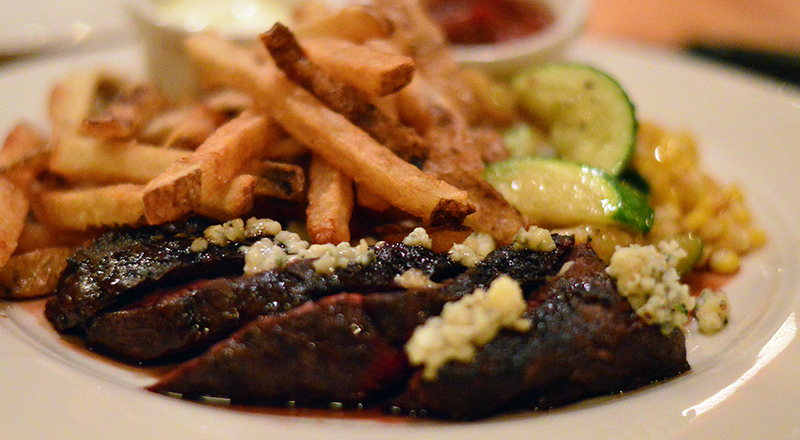 The Coffee Spiced Steak Frites is fab, naturally, with a fierce compliment of red wine reduction and blue cheese that make the delicious house-made ketchup and aioli unnecessary. I found the tiniest whisper of the steak’s toppings made already good frites amazing. We’ve only had one so far, but it was superb. 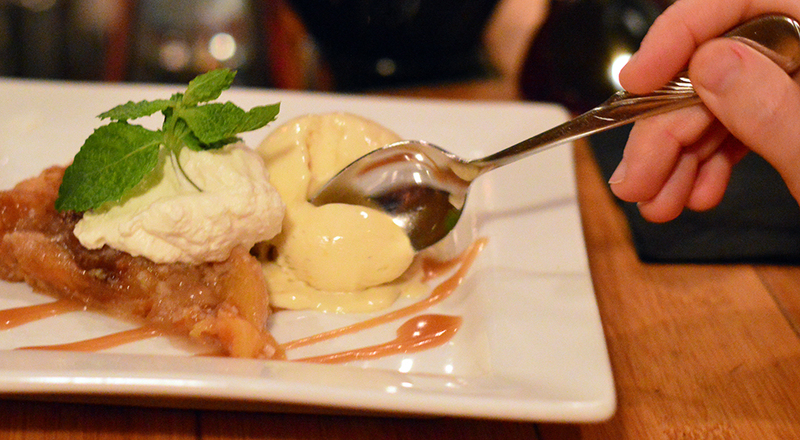 A tarte tatin made with local peaches topped with fresh whipped cream and ice cream. Molly has made many similar desserts at home so we could tell this had most likely spent little time out of the oven. We wouldn’t be surprised if desserts were made daily because the tarte was melt-in-your-mouth fresh. An amazing new regular haunt of ours. Worth the trip if you’re even just passing through the area. This quintessential “hole in the wall” is quirky, busy, and absolutely delicious. An amazing place run by some of the nicest people in the Pioneer Valley. Several visits later we’re impressed with everything we’ve tried there. And you can’t beat the view.